-- copyrighted works whose owners may be impossible to identify and locate -- present a big challenge to archivists, librarians, and creators. How much due diligence do archivists and creators need to do seeking out the correct owners? How can copyright owners protect their rights? Is there a better way to identify ownership to increase both the circulation of musical works and compensation for creators? 03:26PM EST - MB: Orphaned works are becoming a greater issue daily. In Canada we call them "unlocatable copyright works." Very few countries deal with this issue directly. OM: In 2005, Congress asked us to do a study on orphaned works. We identified four categories of potential use: large scale access users (museums, archives, etc. ), enthusiast uses, subsequent creators, and personal uses. WM: I see this issue as being on a spectrum. The copyright office proposal is in the middle, the Canadian copyright board is on one end, and people like Peter are on the other end. Could you explain the Canadian system? MB: In order to use an orphaned work, you have to get a license from the Canadian Copyright Board. We sometimes require that licensees pay a collecting society, who will pay the copyright owner if they show up within five years of the period designated in the license. PG: I'd like to suggest a very simple approach. Copyright just lasts way too long; it's become virtually perpetual. Under the current law, an unpublished work gets 120 years of protection. The blame lies on Congress. When works are about to pass into the public domain, Congress slaps another 20 years on them. As many orphaned works are so old, limiting copyright to a reasonable degree would solve the problem by relegating these works to the public domain. 03:48PM EST - MB: Such a solution would not make the orphaned works problem disappear. We issue a large number of licenses for works that are less than 30 years old. MT: One common misconception is that any folk recording is public domain. Almost all the material in our archive was recorded by anthropologists and journalists. It was meant as documentation. Until very recently, we didn't secure release forms from artists. WD: And there's a whole cottage industry of people releasing compilation recordings of these orphaned works. MT: The Oh Brother Where Art Thou? soundtrack is a famous example. 04:00PM EST - Q: Who is prosecuting the people making these types of compilations? WM: Usually some nephew who didn't get along with the rest of the family (laughter). Note: The posts herein are not transcriptions, to be taken as direct quotes on behalf of the speakers. They are in fact, paraphrases. 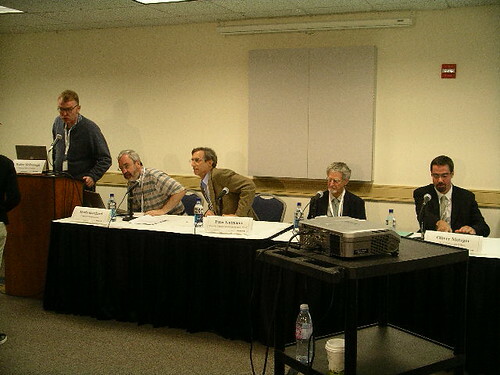 Speakers represented: please consider this a space to correct, comment, or continue discussion from your panel.